Did you decorate your Christmas tree already ? We did it this week end, and this year it's a monochromatic one : gold ! 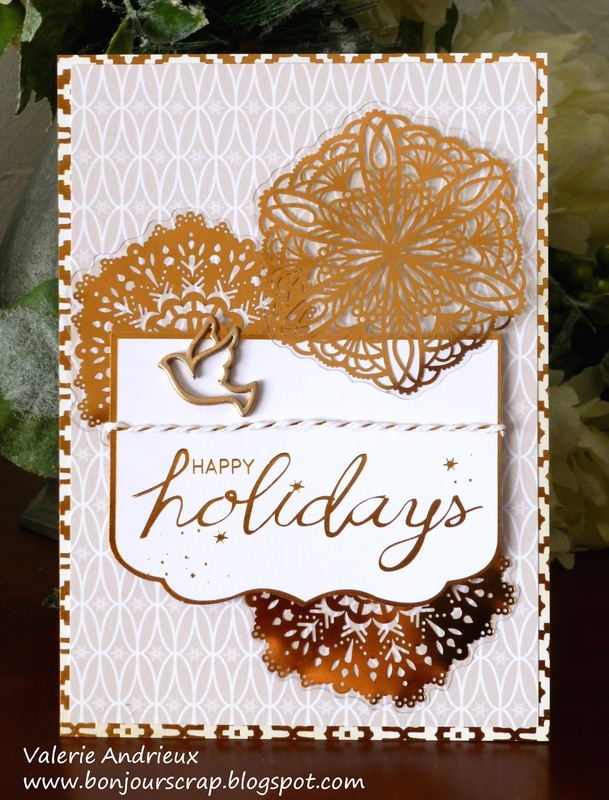 That's inspired me for my card today this morning, a golden snowflakes Holidays card ! I found these acrylic snowflakes in the Gift Decor DIY stack , the gray paper in the Elegant Holidays stack, and the card base paper in the Boho Style stack (so not Christmas theme stack!). All these stacks are by DCWV. I use the twine from a treat Megan from DCWV sent me last year, and a metal dove by PaperBliss painted with Copper by Martha Stewart. To preserve the transparency, I used mini Glue Dots on the snowflakes. Thanks for taking some time to see my card today. Thanks to those who already left comments on my Christmas cards to enter my giveaway. Don't forget to follow my blog too if you want to validate your entry(ies) !